All sixteen of us set off around 8am for a full day of paddling ahead. The morning started off pretty slow with a few hours on very slow moving water that required more paddling to make fair forward progress. We were still in a gorge, and the scenery was great. 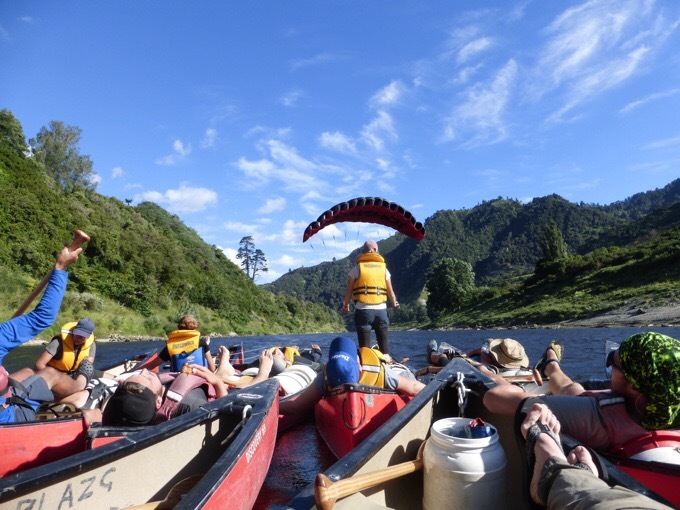 Along with our group of eight canoes, there are many others doing the Whanganui Journey canoe. There were around 50 people at the campsite last night, and there are many other campsites that other paddlers come from. It was a busy morning seeing others. They all were on their last day of their trip. 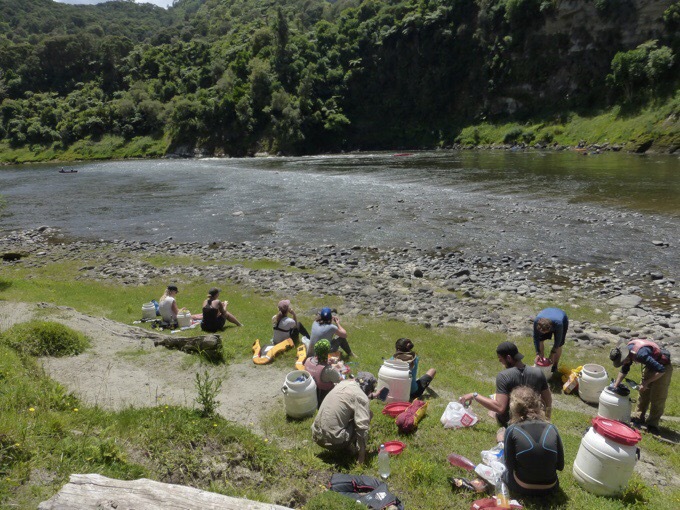 Those doing the Whanganui Great Walk Journey end at a spot called Pipiriki and reached that at lunch today. 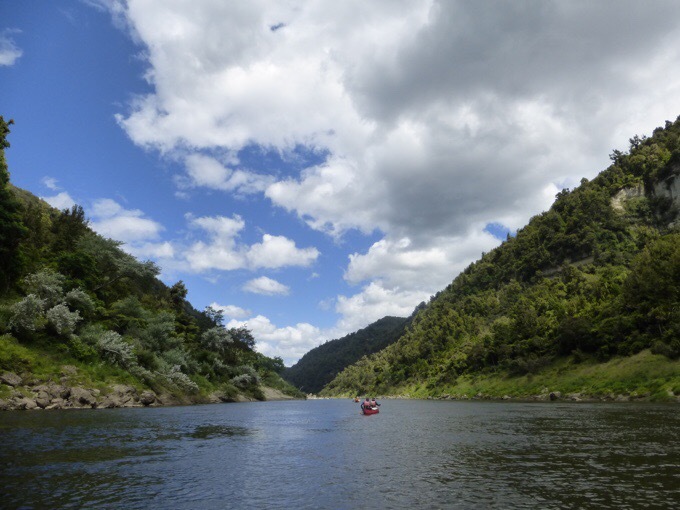 At Pipiriki, the trail notes give TA hikers three options for getting to Whanganui: paddling, bike riding, or walking the road. 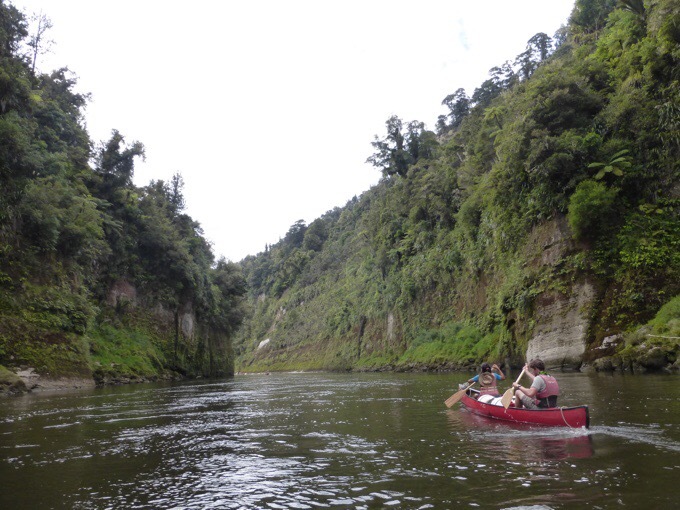 We will paddle, and will go an additional day and a half or so further into Whanganui to land there on Christmas Eve. Our group did a good job of sticking together though we didn’t have to. 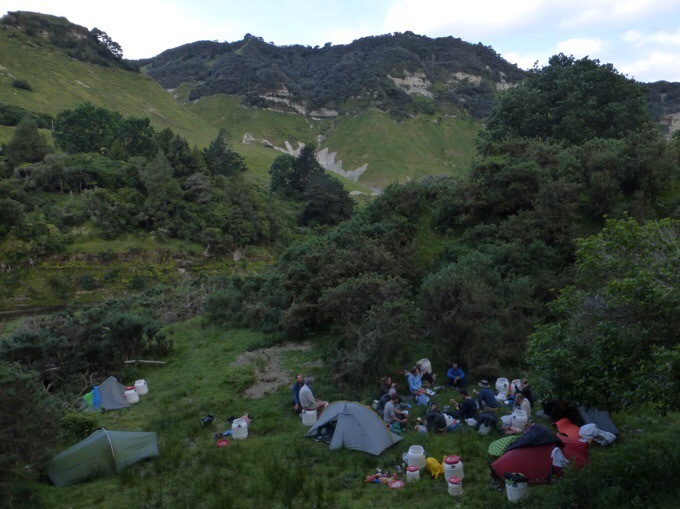 We now can freedom camp past Pipiriki because it is outside the Whanganui National Park, but there is also private land to be aware to avoid. We didn’t have a ton of info on camping, but the canoe company mentioned an island in the middle of the river that they thought people were camping on that nicely split the distance of today and tomorrow. Our group was generally in eyesight of one another, and again, at times we would link up as one big raft for periods of time and just relax and float. Songs were sung, jokes were told, and even a group game was played. My favorite was the singing and hearing songs sung in so many foreign languages. 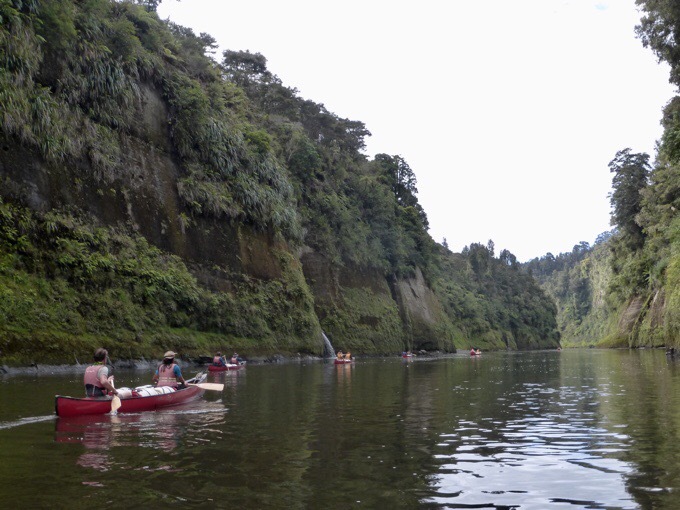 At one point, with a tourist couple joined in on our raft, we had 9 canoes and 18 people from 9 different countries. (France, Canada, United Kingdom, Italy, US, Germany, Holland, New Zealand, and Sweden). Each country sang at least one song in their language and that was really cool. When a group of tourists came by on many canoes, we all stood up and did our silly fruits song and dance and they all enjoyed it. There were also Christmas songs sung throughout the day since we are so close to Christmas. Some people in this group can sing quite well, and it’s entertaining. I like this photo of all of us linked together because it is a candid shot and you can see the smiles on everyone’s faces in conversation. It’s just really unique to have this group of 16 people working together so well and enjoying one another’s company. 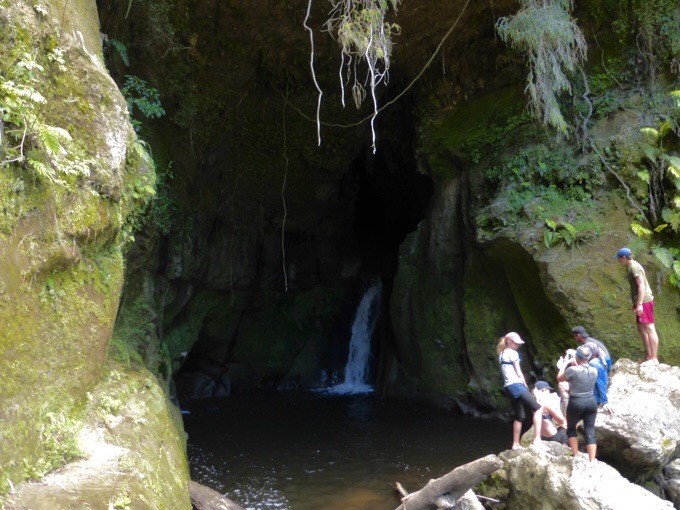 Before lunch, there was a side trip to check out a small cave with a waterfall that provided a nice break from rowing. Then we hit our first of many Class 2 rapids. 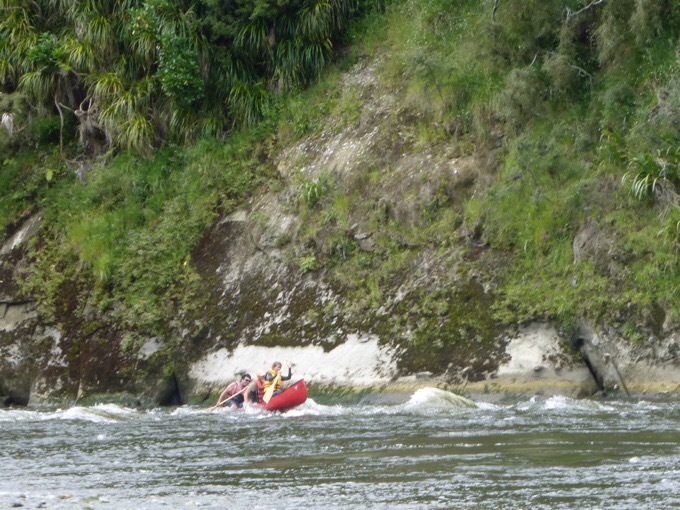 We’ve had rapids, but the ones today were significantly more exciting with a higher chance of flipping over. If people do flip, the rapid is so small that they would flip at the end and just float over to the side to flip it back over and bail the water. There is little chance of getting hurt in the process. The first one was one where the canoe goes over a bit of waves and the canoe goes up pretty high on one of them and the front person gets to catch some air and probably gets splashed pretty good on the way down. It was a fun one. The second one we did was right before lunch. It had a longer rough section that really had a good four or so waves that the canoe went over quite swiftly. Anyone sitting in front (like me) likely got soaked with at least one full on wave crashing over them. The water was a good temperature, and it was a nice day, so it was fun. We stopped for lunch on the bank right next to it and got to watch the dozen or so canoes and kayaks behind us go through. A handful of them flipped and it was an entertaining show. Some got so much water in their canoes that they had to pullover and use their bailing buckets. There was a more skilled group of adults with kids that easily navigated around the rapids and stayed completely dry. 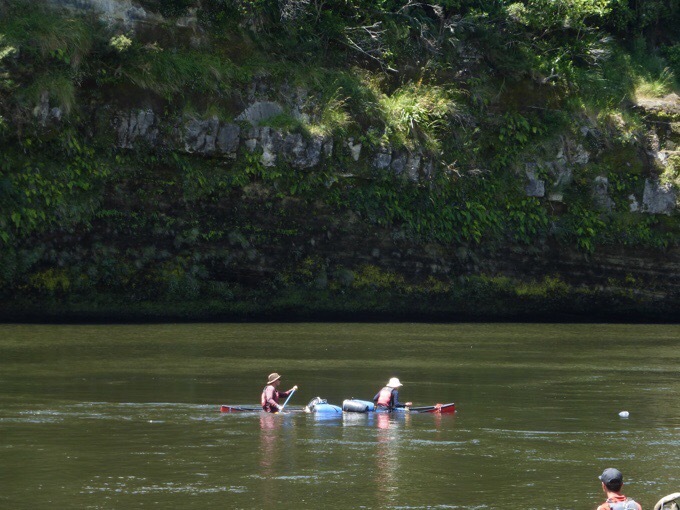 Two older women chose to come out and just drag their boat around the rapid over some shallow rocks. 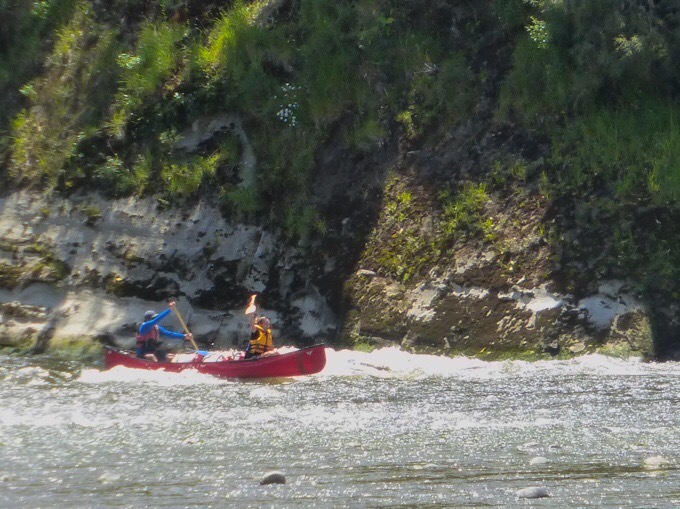 So, it is possible to work around the rapids if people find them too intimidating, but you need to know what you’re doing, which few of us do, ha! A couple pairs from our group even pulled their canoe back upstream and did it again for fun. We had a nice long lunch break watching all the fun. Lunch watching the rapid action on the far side of the river. Jacob, Matt, and Becky going out for a second run. One of the waterlogged canoes pulling over to bail. 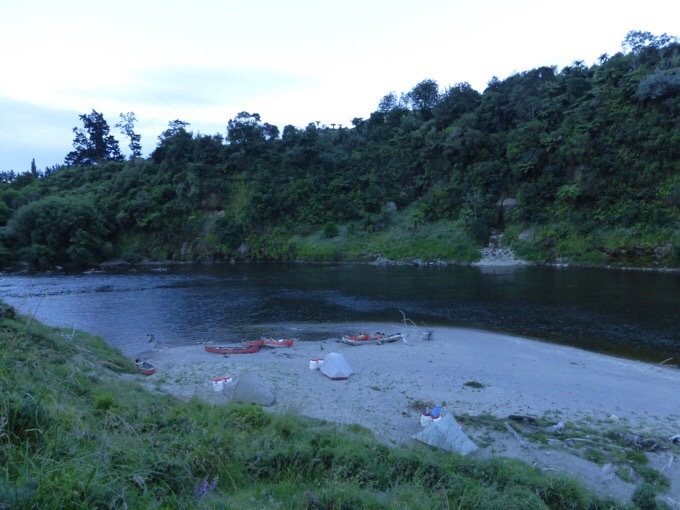 After lunch, we reached Pipiriki, and the current got a lot swifter, so the second half of our day went faster. We were on a new set of guidebook descriptions and maps that I don’t like as much as the ones we got from the canoe company. The descriptions were just different, and it was an adjustment from what we had before. Frits and Becky were ahead of us leading the group on one rapid. Frits had gotten comfortable with standing up and had enjoyed scaring Becky a bit. With seven brothers, I think Becky is pretty used to this behavior, and takes it in stride. On this particular rapid, Frits was standing up going into it (others in the group had been standing at times as well), and misjudged the current. It did not go well, and watching this unfold was frightening. It was a tight turn with swift rapids and very low hanging willows on the outside of the turn. The goal would be to hug the turn and not get clotheslined by the willows. Well, for Frits and Becky, the canoe didn’t turn and they barreled right into the low hanging willow branches. It happened quick, and they disappeared into the branches. The next thing we saw was Frits in the water holding onto the canoe (right side up) while being pushed downstream by the current and Becky not far behind. While all this was happening, our canoe was in motion and heading into the same turn just after them. We flew through and also got pushed into the willows, but far enough out that I was able to lay back and have the branch we went under go over me. As we went through the willows, we saw Becky in the shallow swift water. She was okay and being pushed downstream in a controlled way by the current. We were able to pull over just after the current and catch one of the paddles as it was being washed downstream. Becky waded over and got in our canoe while Heartbreaker hiked up the shore and retrieved their second paddle stuck in the willows. Then we took her downstream to where Frits was pulled over so they could get situated and continue on. Through Becky’s telling, what happened was that she did get clotheslined by a large branch hanging just parallel to the water. The strong current pinned her against the thick branch, and the canoe kept going without her. The rocks were shallow, so she was basically pinned between rocks and the branch right at water level. The branch was at her chest and her arms were under the branch. The current was too strong to get them up as the water was rushing up in her face in bouts. She couldn’t get over or under the branch, so she shimmied along the branch until it got thinner and she let go. Frits said he fell out trying to reach out to the branch she was pinned against. That was our excitement for the afternoon, and Becky says now she gets to email her mom and let her know she almost died, ha! Plus, she said now I have something to write in the blog, haha. Becky takes it all in stride and is quite resilient. 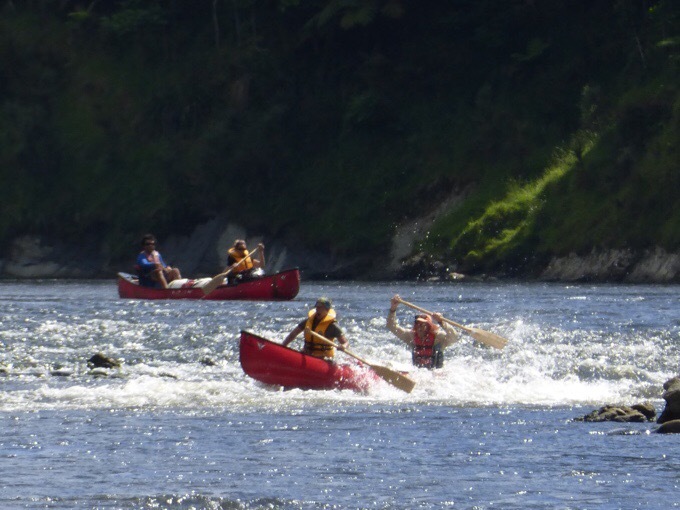 Given that we have eight canoes, and many rapids, it’s pretty good that we’ve only had one mishap. 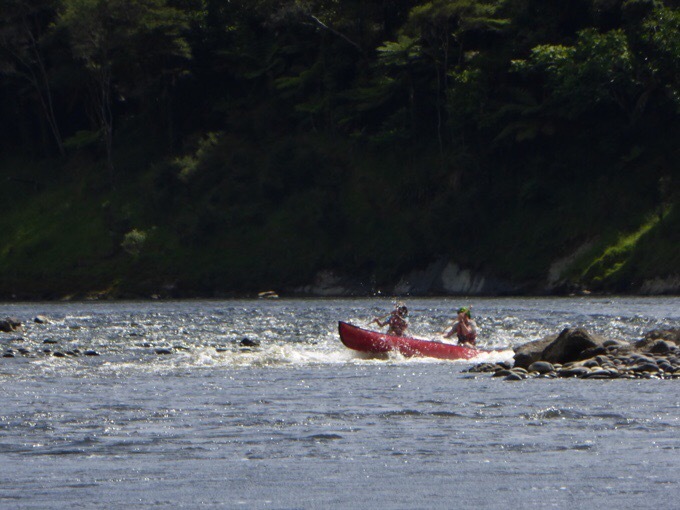 We had a few more rapids, and the rest of the day went pretty fast with a tailwind. For the last 1.5mi/2.5km, all eight of our canoes linked together and laid there while the wind and current pushed us in. It was a great way to end the day. Someone even had a kite that acted as a little sail. It was definitely one of those moments where you think, this is the life. The goal for camping was to land at an island that the canoe company told us many use for camping. 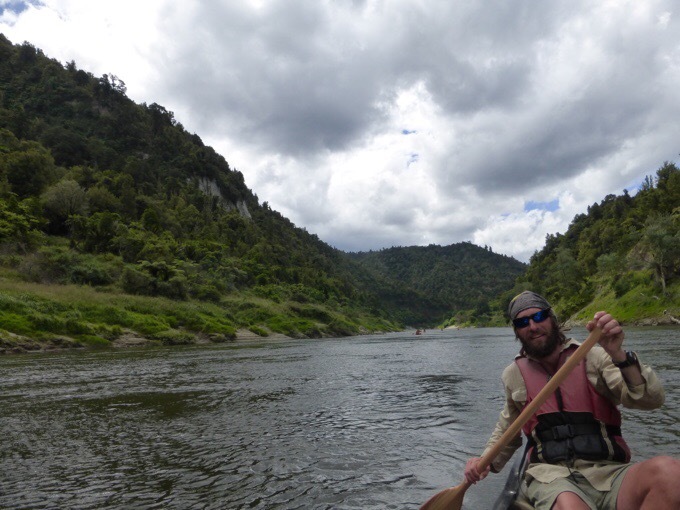 When we got to it, we found that it was quite rocky, and doable, but that the right bank just downstream from the island was even better, and we settled there around 7pm. It felt more like an island than the island did and it felt like we were in an episode of LOST. We walked around looking for camping and ended up spreading out to different areas that held 2-5 tents at each spot. I ended up taking a sandy spot near the boats since I didn’t mind the sand and it was close to the canoes, so I didn’t have to lug the dry barrels too far. The group still came together for family dinner, which again, is pretty cool to have a group willing to go out of their way to come together for dinner after a long day. Another great day with a great group! “It was definitely one of those moments where you think, this is the life.” These are the moments that keep us going. I really dig that fact everyone does a family dinner. It takes effort but there’s something to that communal activity. Family is very important even if the only thing that binds is the trail or river in this case. I really have enjoyed this section. Wish I could be there too. It’s Christmas Eve here. Hoping you and your whole family have a wonderful and blessed Christmas. Tell them all Warren said hi. Happy Christmas, Erin & Becky!! What a fantastic adventure ! And Merry Christmas -it will certainly be one to remember . Please pass on my Christmas wishes to Becky . I think between you both , you win all the medals for “girl power ” . Have a great day wherever you are . Haha! It’s a Christmas miracle. And I like that you had to use the word perfect on this post of course. A real thru hiker would have walked at the first opportunity. I thought a real thru hiker would follow the trail, including being able to choose between official options? They just wouldn’t skip a chunk. Erin.. I’ve just read the three books by Fozzie who has hiked the AT and PCT and elsewhere and he also speaks of NOT hitching around sections..
You absolutely aren’t alone (but you know that). Wow that Becky has SEVEN brothers!! Why would you paddle when you could hike? Makes a mockery of Wired’s thru hike. She is just a tourist now, along with those who are lame enough to hitch. 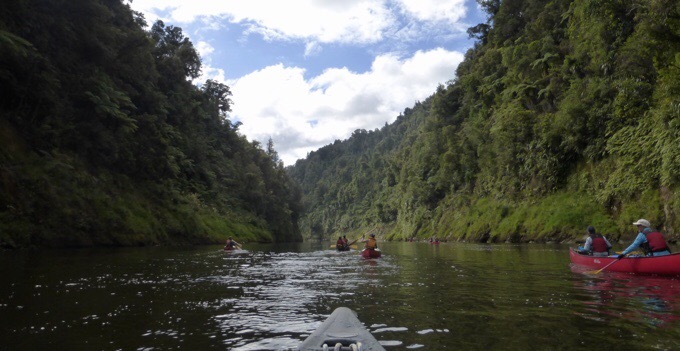 The paddle is an official part of the TA and the Whanganui Journey is one of NZ Great Walks as I mentioned. 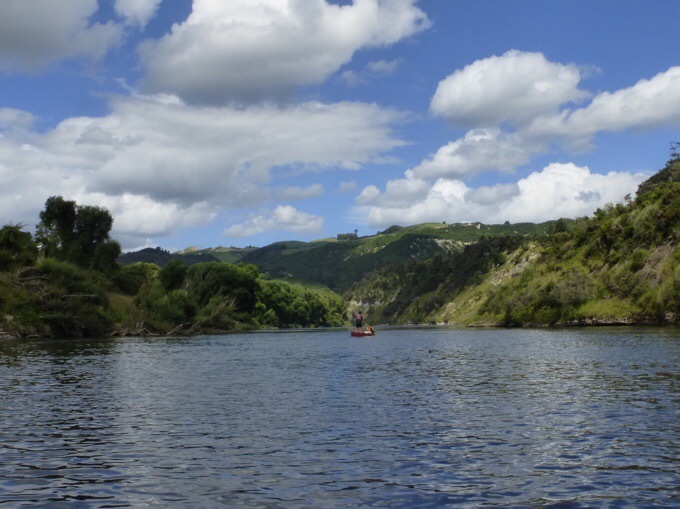 The river journey IS the Te Araroa route and form of travel. I’ve explained many times the difference in walking (or in this case canoeing) and hitching. No need to repeat that. Yes I do know that and am surrounded by other thru-hikers that have walked the whole track a lot lately, so I’m definitely not alone out here and they all understand it just as most of my readers do. What an adventure 🙂 Merry Christmas!